To be aware of the probable future trends in heart valve disease epidemiology. Number of deaths per year due to heart valve disease in the USA, by cause. Reproduced from Coffey et al10 under license from Elsevier.AVD, aortic valve disease. The disease burden of RHD may continue to decrease with ongoing implementation of World Heart Federation (WHF) recommendations on diagnosis and management of RHD.16 ,17 The WHF have identified five key targets, focused on endemic areas, likely to provide the greatest benefit in its goal of reducing RHD deaths in those aged under 25 years by 2025. These are establishment of RHD control programmes, ensuring the availability of benzathine penicillin G, recruitment of a public figure to champion RHD causes, establishment of at least one major RHD hub in each geographic region, and a phase III clinical trial of a vaccine against group A streptococcus. Although not a key target, the lack of access to essential cardiac medication and to effective anticoagulation monitoring was also identified by the WHF as a barrier to reduction of RHD mortality.17 This was highlighted recently by a registry of patients from Yemen, India and 12 African countries showing only 69% of those with an indication for anticoagulation were receiving it, and of these, only 28% had an international normalised ratio within the therapeutic range.18 Control of incidence and recurrence, the main outcomes expected to be improved by implementation of the WHF recommendations, should contribute to a reduction in morbidity and mortality, initially in the under-25s and, with time, throughout the population. Although ARF has almost disappeared in high-income countries, it is important to remain aware of RHD, which remains prevalent in migrant people. This concerns in particular young women, given the high risk of pregnancy-related complications in mitral stenosis. Prevalence of aortic stenosis according to age group in the Tromsø study. 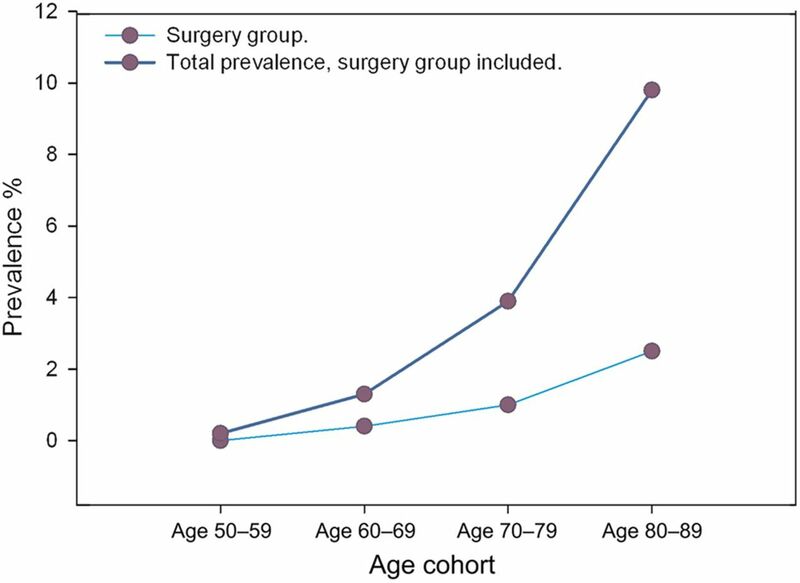 The percentage having surgery increases with age, but not to the same extent as prevalence. 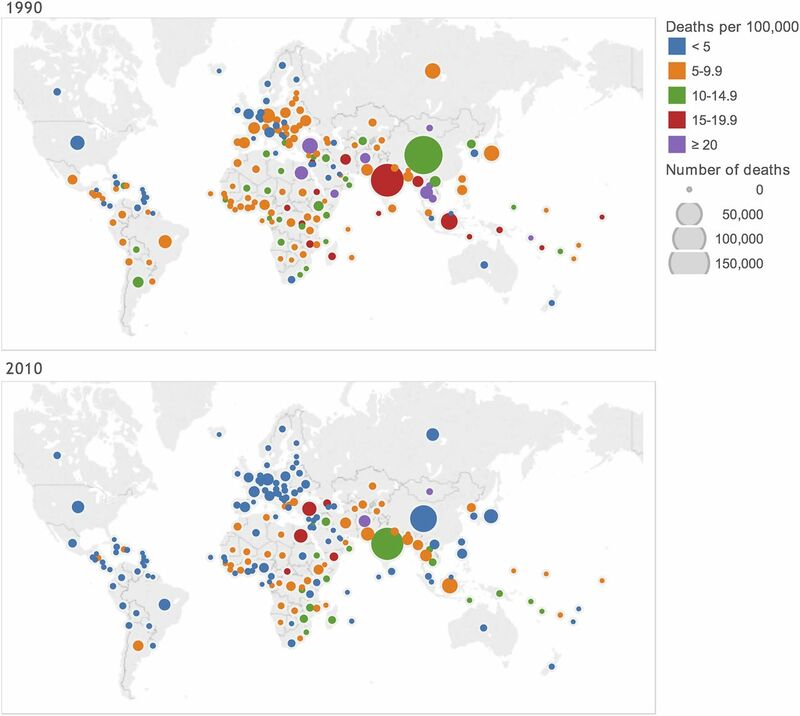 Reproduced from Eveborn et al27 under license from BMJ Publishing Group Ltd.
Once RHD prevalence begins to decrease, CAVD can be expected to play a relatively more important role as a cause of AS in low-income countries. In addition, the mean life expectancy in many low-income countries is currently below the age at which AS due to CAVD becomes clinically significant (eg, the average life expectancy at birth in Africa was 58 years in 2012).46 The high prevalence of risk factors for CAVD such as hypertension and increasing life expectancy mean that there is likely to be a substantial future burden of CAVD in low-income countries. The major causes of endocarditis have changed with time. Hospital-based studies suggest an increase in endocarditis due to Staphylococcus aureus and coagulase-negative staphylococcus in North America, associated with an increase in intravenous drug use-associated endocarditis.54 Different population-based studies in Europe and Australia now report Staphylococcus as the leading cause of infective endocarditis.49 ,55 ,56 It is also likely that healthcare-associated infective endocarditis contributes to staphylococcal predominance. Healthcare-associated endocarditis represents 25–30% of cases of infective endocarditis and is associated with a higher risk profile. Cardiac implantable electronic device (CIED) infections are another major cause of endocarditis in high-income countries, with 23–37% of those with CIED infections having heart valve involvement.57 ,58 The increasing implant rate seen over the past few decades has led to a consequent increase in CIED infection in the USA.59 In addition, the increasing tendency to implant devices in patients with more comorbidities, and to implant more complex devices, has been associated with an increased rate of CIED infection since the mid-2000s.59 Other high-income countries such as the UK are also seeing a continuing increase in CIED implantation,53 and it is likely therefore that CIED-associated endocarditis incidence will continue to rise. MR can be either primary (due to a problem with the valve or subvalvular apparatus themselves) or secondary (also called functional, where the valve and subvalvular apparatus appear normal but a separate LV abnormality prevents coaptation of the leaflets). The most common causes of primary MR in industrialised countries are mitral valve prolapse, RHD and endocarditis.36 Mitral valve prolapse has a prevalence of 2.4% in the population, although the degree of associated MR is most commonly trivial or mild.65 Unlike calcific aortic disease, no clinical risk factors have been clearly identified for mitral valve prolapse. Secondary MR is a frequent finding in the setting of cardiomyopathy – 49% had mild to moderate secondary MR and 24% had severe secondary MR in one series of 1256 patients.66 No population-based study allows for a reliable estimation of the prevalence of secondary MR. However, extrapolations derived from available data suggest a high burden in the community.67 Due to the associations between MR and age,63 and between secondary MR and heart failure, there is likely to be an increase in prevalence of MR over the coming decades. Aortic regurgitation (AR) can be due to a primary cause such as BAV or secondary to aortic root dilatation. AR of mild or greater severity was seen in 13% of men and 8.5% of women in the Framingham Offspring study,63 while moderate or more severe AR was estimated to be prevalent in approximately 0.5% of the total US population.35 In an African-American cohort, 9% had mild AR and 0.5% had moderate or more severe AR.64 Again, all of these prevalences increase with increasing age. Survival in patients with tricuspid regurgitation on clinically indicated echocardiography. 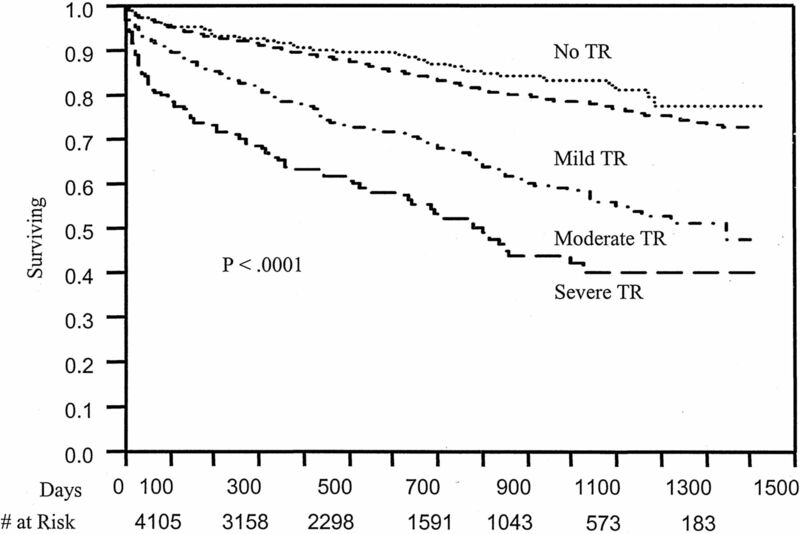 Severe tricuspid regurgitation (TR) was associated with reduced survival even after adjustment for age, LV and RV systolic function, and RV size. Reproduced from Nath et al68 under license from Elsevier. Causes of tricuspid regurgitation due to cardiac implantable electronic device leads. (A) Direct interference with leaflet coaptation. (B) Fibrous adhesions between leaflet and lead. (C) Interference with subvalvular apparatus. (D) Leaflet perforation. (E) Annular dilatation due to chronic ventricular dyssynchrony related to RV pacing. Reproduced from Al-Bawardy et al70 under license from Wiley Periodicals. With the improved survival of patients with congenital heart disease due to improved paediatric cardiac surgical techniques,74 it is likely that there will be an increase in the numbers of adults with HVD of congenital origin, who often have concomitant complex congenital heart problems. Prosthetic valve disease is an increasingly common reason for valve replacement or repair. Prosthetic valves may be sites for thrombus formation (particularly mechanical valves, for which anthithrombotic therapy is indicated), or pannus outgrowth, which can obstruct the normal functioning of the prosthesis.75 Physical failure is relatively rare in mechanical prostheses, but bioprostheses may undergo structural valve deterioration, resulting in stenosis, regurgitation or leaflet fracture. Valve failure can lead to a requirement for repeat valve replacement or, in those with bioprotheses, valve-in-valve insertion.76 Long-term data on transcatheter valves are limited due to both their recent introduction and the shorter life expectancy of current recipients. More common in transcatheter aortic valves is a finding of paravalvular AR, with recent studies finding that moderate to severe AR was common in the 30 days after implantation (approximately 15% of patients), was largely paravalvular, and was a strong predictor of subsequent mortality.77–79 Given the relatively short follow-up available, clinicians should remain vigilant for novel complications related to ageing transcatheter valves. More recently, it has been recognised that the other autoimmune connective tissue diseases also carry a significantly increased risk of HVD. For example, rheumatoid arthritis is associated with a greater than fivefold increased risk of TR and AS and more than threefold increased risk of MR.84 A low threshold for investigation of potential HVD should be maintained in these patients. Radiation and drug-induced valve disease (DIVD) are relatively recent phenomena.85 ,86 Both may raise diagnostic problems with other restrictive valve diseases, particularly RHD, highlighting the importance of interpreting echocardiographic findings according to the clinical context. The response to associations with DIVD has varied according to country—fenfluramine and benfluorex, appetite-suppressing drugs closely linked with DIVD, were withdrawn from sale after the association with HVD was recognised,87–89 while the ergot-derived dopamine agonist pergolide was withdrawn from sale in the USA but remains available in other markets, albeit with new warnings.90 The European Medicines Agency recommends an echocardiogram at baseline and regularly during treatment for patients prescribed pergolide or another DIVD-associated dopamine agonist, cabergoline.90 Low-dose cabergoline, used for the treatment of prolactinomas, has not been definitively associated with DIVD.86 DIVD appears histologically identical to carcinoid valve disease and so it is not surprising that serotonin, via the serotonin 2B receptor, is the culprit mechanism.91 Fortunately given the very large number of prescriptions worldwide, selective serotonin reuptake inhibitors do not appear to cause DIVD.92 ,93 As with autoimmune connective tissue diseases, a high index of suspicion for HVD is required in patients who have had exposure to drugs linked with DIVD. Of the different forms of HVD, RHD appears to be slowly coming under control, even in some high-risk populations. As RHD mortality and morbidity has decreased, it has been overtaken by ‘degenerative’ causes of HVD, particularly CAVD. The burden of mortality and morbidity associated with these age-related diseases can be expected to increase worldwide due to increasing life expectancy. Rheumatic heart disease primarily affects those in low-income countries and high-risk groups in high-income countries, and led to an estimated 275 100 deaths worldwide in 2013. The incidence of acute rheumatic fever in high-risk groups in high-income countries has either remained unchanged or increased in the past two decades, while data from low-income countries are limited. Rheumatic heart disease mortality is decreasing in both high-income and low-income countries worldwide. In high-income countries, aortic stenosis is the largest contributor to deaths due to heart valve disease. In those with tricuspid aortic valves, although progression of aortic stenosis is an active process, calcific aortic valve disease presents primarily as a disease of old age. 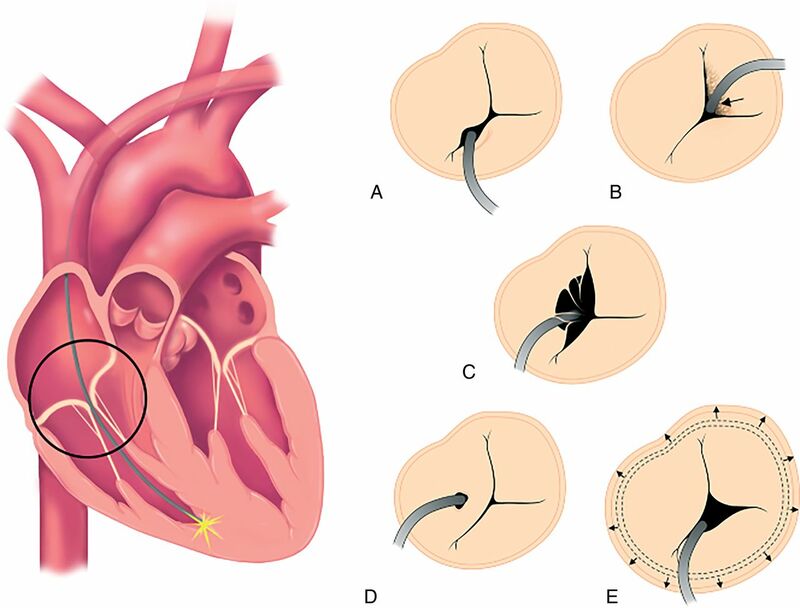 Mitral regurgitation is a particularly heterogeneous group, comprising diverse aetiologies of organic mitral regurgitation and the possibility of regurgitation through a structurally normal valve, secondary to LV remodelling. The ageing of the population, especially in high-income countries, is predicted to lead to a significant increase in the burden of aortic stenosis and endocarditis over the coming decades. RCP credits: Log your activity in your CPD diary online (http://www.rcplondon.ac.uk/members/CPDdiary/index.asp)—pass mark is 80%. EBAC credits: Print out and retain the BMJ Learning certificate once you have completed the MCQs—pass mark is 60%. EBAC/ EACCME Credits can now be converted to AMA PRA Category 1 CME Credits and are recognised by all National Accreditation Authorities in Europe (http://www.ebac-cme.org/newsite/?hit=men02). Please note: The MCQs are hosted on BMJ Learning—the best available learning website for medical professionals from the BMJ Group. If prompted, subscribers must sign into Heart with their journal's username and password. All users must also complete a one-time registration on BMJ Learning and subsequently log in (with a BMJ Learning username and password) on every visit. Institute for Health Metrics and Evaluation. 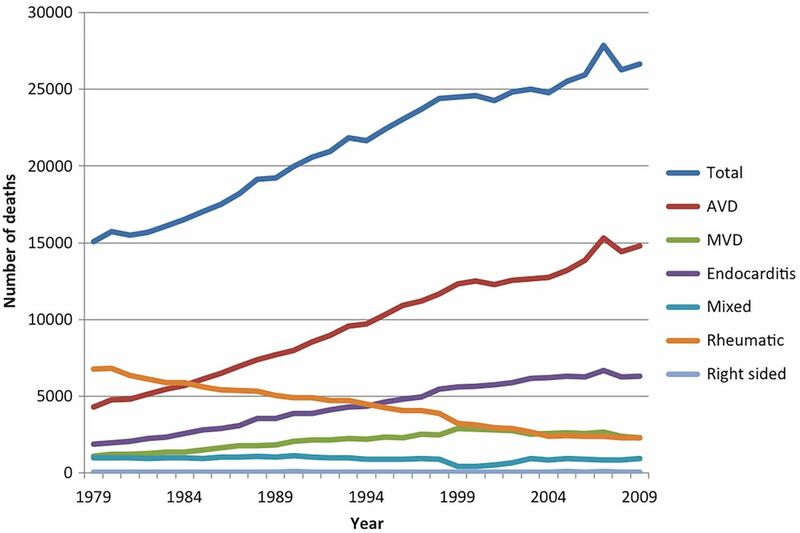 Global Burden of Disease Study 2010 (GBD 2010) Data Downloads. 2014. http://ghdx.healthdata.org/global-burden-disease-study-2010-gbd-2010-data-downloads (accessed 14 Jan 2015). World Health Organization. Global Health Observatory Data Repository. http://apps.who.int/gho/data/node.main.688?lang=en (accessed 12 Jan 2015). National Institute for Health and Clinical Excellence. Prophylaxis against infective endocarditis: Antimicrobial prophylaxis against infective endocarditis in adults and children undergoing interventional procedures. Manchester: NICE, 2008. World Health Organization. Antimicrobial resistance: global report on surveillance 2014. Geneva: World Health Organization, 2014.
. Valvular heart disease associated with benfluorex. Rev Esp Cardiol 2003;56:215–16. European Medicines Agency. Ergot-derived dopamine agonists. 2008. http://www.ema.europa.eu/ema/index.jsp?curl=pages/medicines/human/referrals/Ergot_derived_dopamine_agonists/human_referral_000107.jsp (accessed 3 Jun 2015). RHDAustralia (ARF/RHD writing group). Australian guideline for prevention, diagnosis and management of acute rheumatic fever and rheumatic heart disease. 2nd edn. Menzies School of Health Research, 2012. Working Group on Pediatric Acute Rheumatic Fever and Cardiology Chapter of Indian Academy of Pediatrics. Consensus guidelines on pediatric acute rheumatic fever and rheumatic heart disease. Indian Pediatr 2008;45:565–73. Heart Foundation of New Zealand. New Zealand guidelines for rheumatic fever: diagnosis, management and secondary prevention of acute rheumatic fever and rheumatic heart disease: 2014 update. Auckland: Heart Foundation of New Zealand, 2014. Department of Health Pretoria. National Guidelines on Primary Prevention and Prophylaxis of Rheumatic Fever and Rheumatic Heart Disease for Health Professionals at Primary Level. South African Med J 1999;(Suppl 2):C91–4. World Health Organization. Rheumatic fever and rheumatic heart disease: Report of a WHO expert consultation, Geneva, 29 October—1 November 2001. Geneva, 2004. Contributors The manuscript outline was designed by SC and BJC. SC performed the initial literature search and wrote the first draft. BJC and BI revised the manuscript critically. All authors reviewed and approved the final version. Funding SC is supported by the National Institute of Health Research (NIHR) Oxford Biomedical Research Centre Programme. BJC acknowledges support from the British Heart Foundation Centre of Research Excellence, Oxford (British Heart Foundation grant no. RE/13/1/30181). Disclaimer The views expressed in this publication are those of the authors and not necessarily those of the Department of Health. Competing interests BI has received consultant fees from Abbott, Boehringer Ingelheim, Valtech, and speaker's fees from Edwards Lifesciences. Heartbeat: Echo anytime, anywhere by anyone?